I don’t know about you, but I’ve been running out of HDMI ports for as long as they’ve existed. Beats me why no TV manufacturers ever equip their sets with more than four. Maybe it’s only a problem for people who perpetually feel the need to own every modern gaming console and a streaming box. But right now I have all four ports occupied, the fourth by a five-way splitter that itself is entirely occupied. What this means is that each time an enticing new TV-adjacent gadget comes out, I have to make a tough decision about what to remove from my setup. Until this past week, I’d barely touched the PlayStation Classic I bought on a Boxing Day fire sale, simply because I didn’t have anywhere to plug it in. Half its value as a product is as a cute ornament, sure, but I should at least be able to play the odd round of Ridge Racer Type 4. Then I took delivery of a pink battery-powered monitor and everything was fine. The Taihe Gemini is a 15.6-inch monitor raising funds on Kickstarter and is currently at more than 100 times over its target. Portable monitors aren’t altogether new, but good ones are; we saw a few at CES, and it’s starting to be the kind of thing that pretty much any small Chinese company can pop onto the market. What makes the Gemini stand out is its useful design and flexibility. It’s basically a big Surface Pro without a computer, or a tiny TV without a tuner. 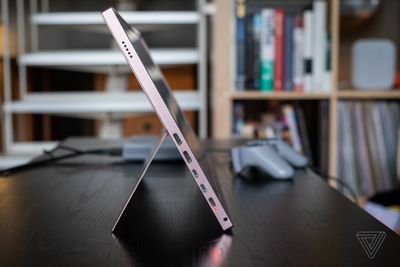 The 8mm-thick metal chassis (in my case rose gold), 5,000mAh battery, built-in speaker, and Surface-style kickstand mean it can be carried and placed everywhere — including a laptop sleeve in a bag — while its versatile connectivity options let it work with pretty much any device you can think of. The pre-production version I tested has a matte 1080p touchscreen. It’s not the most beautiful display in the world, with pedestrian color reproduction at 72 percent of the NTSC gamut, but it is at least an IPS panel with solid viewing angles. There’s also a 2mm-thicker 4K model that omits touch functionality but achieves a claimed 100 percent of Adobe RGB coverage. I wasn’t able to test that version, so I can’t speak to its supposedly better color performance. The touch functionality on the 1080p model sadly doesn’t extend to its janky button-operated settings menu, but it’s actually pretty cool if you have a compatible phone with a desktop mode, like a Samsung Galaxy Note with Dex or a Huawei device that supports Easy Projection. I tried plugging the Honor View 20 into the Gemini over USB and it immediately brought up the desktop view while charging the phone. Everything was controllable with the touchscreen or by using the phone as a trackpad and keyboard. I’m still not convinced anyone ever uses these modes for anything, but it feels more practical with the Gemini than it would as part of a full-on desktop setup. The other big difference with the two Gemini models is, for some reason, their connectivity. The 4K model has a full-sized HDMI port, a Mini DisplayPort, one USB-C port, and two USB-A 3.0 ports. But the 1080p model has two Mini HDMI ports and two Micro USB ports alongside the USB-C port, which seems much less useful to me. There really ought to be a full-size HDMI port on this thing, and USB-A 3.0 would be a good match too — you could theoretically plug something like an Amazon Fire TV stick into the HDMI port and power it over USB from the same device. Taihe does include an HDMI-to-Mini HDMI cable and a Micro USB-to-USB-A adapter, among other accessories, but it’s unfortunate that the 4K model’s I/O is so much better — you basically have to choose between that and touch functionality. Still, if you have the right cables you can use the Gemini with basically anything. I mentioned the PlayStation Classic earlier, because the Gemini is a particularly good fit for retro consoles; you can power them off a USB battery pack and play anywhere without a wall outlet. 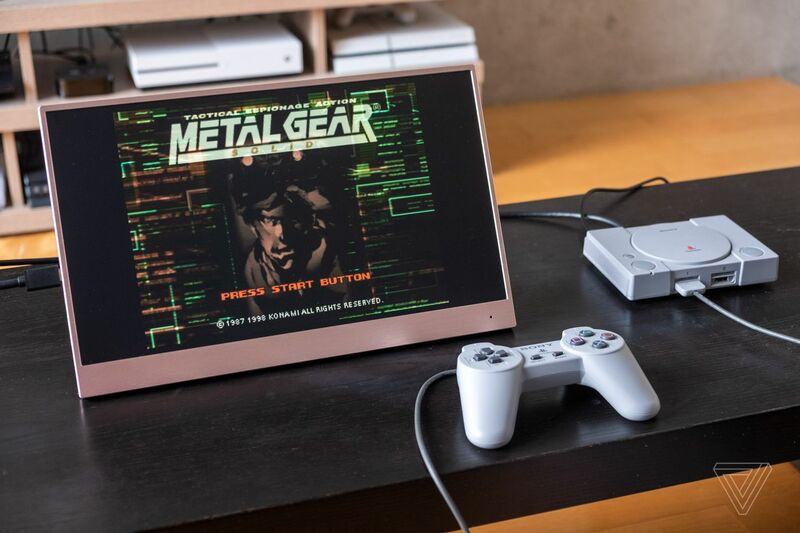 Taihe claims five hours of battery life, and I managed to use it for about that long playing through a bunch of the original Metal Gear Solid — which is to say I nearly finished the game. I’ve also used it hooked up to my MacBook Pro over USB-C, and if the weather hadn’t been so cold recently I’d consider it a pretty good two-monitor solution for my roof terrace. I don’t know why there haven’t been a million devices like this already, because it’s an obviously convenient design that I think most people could find a use for. I don’t think the Gemini is the best possible iteration, however; the 1080p model’s panel is mediocre, its I/O situation is weird, and its menu system is fiddly. But it’s good enough, particularly for the $219 it’s been selling for on Kickstarter, to untether me from my couch and my desk in certain situations. It’s a classic gadget; it is what you make of it. Taihe says the 1080p model will retail for $299 while the 4K model will cost $499, though they’re available to backers for $219 and $329 respectively on Kickstarter right now. As ever, you should exercise caution with small companies on crowdfunding sites, but in this case I can at least confirm the product’s existence and performance. The Taihe Gemini will sell you on battery-powered monitors I don’t know about you, but I’ve been running out of HDMI ports for as long as they’ve existed. Beats me why no TV manufacturers ever equip their sets with more than four. Maybe it’s only a problem for people who perpetually feel the need to own every modern gaming console and a streaming box. But right now I have all four ports occupied, the fourth by a five-way splitter that itself is entirely occupied. What this means is that each time an enticing new TV-adjacent gadget comes out, I have to make a tough decision about what to remove from my setup. Until this past week, I’d barely touched the PlayStation Classic I bought on a Boxing Day fire sale, simply because I didn’t have anywhere to plug it in. Half its value as a product is as a cute ornament, sure, but I should at least be able to play the odd round of Ridge Racer Type 4. Then I took delivery of a pink battery-powered monitor and everything was fine. The Taihe Gemini is a 15.6-inch monitor raising funds on Kickstarter and is currently at more than 100 times over its target. 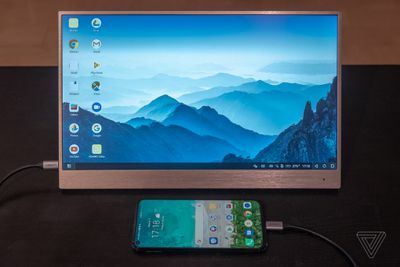 Portable monitors aren’t altogether new, but good ones are; we saw a few at CES, and it’s starting to be the kind of thing that pretty much any small Chinese company can pop onto the market. What makes the Gemini stand out is its useful design and flexibility. It’s basically a big Surface Pro without a computer, or a tiny TV without a tuner. The 8mm-thick metal chassis (in my case rose gold), 5,000mAh battery, built-in speaker, and Surface-style kickstand mean it can be carried and placed everywhere — including a laptop sleeve in a bag — while its versatile connectivity options let it work with pretty much any device you can think of. The pre-production version I tested has a matte 1080p touchscreen. It’s not the most beautiful display in the world, with pedestrian color reproduction at 72 percent of the NTSC gamut, but it is at least an IPS panel with solid viewing angles. There’s also a 2mm-thicker 4K model that omits touch functionality but achieves a claimed 100 percent of Adobe RGB coverage. I wasn’t able to test that version, so I can’t speak to its supposedly better color performance. The touch functionality on the 1080p model sadly doesn’t extend to its janky button-operated settings menu, but it’s actually pretty cool if you have a compatible phone with a desktop mode, like a Samsung Galaxy Note with Dex or a Huawei device that supports Easy Projection. I tried plugging the Honor View 20 into the Gemini over USB and it immediately brought up the desktop view while charging the phone. Everything was controllable with the touchscreen or by using the phone as a trackpad and keyboard. I’m still not convinced anyone ever uses these modes for anything, but it feels more practical with the Gemini than it would as part of a full-on desktop setup. The other big difference with the two Gemini models is, for some reason, their connectivity. The 4K model has a full-sized HDMI port, a Mini DisplayPort, one USB-C port, and two USB-A 3.0 ports. But the 1080p model has two Mini HDMI ports and two Micro USB ports alongside the USB-C port, which seems much less useful to me. There really ought to be a full-size HDMI port on this thing, and USB-A 3.0 would be a good match too — you could theoretically plug something like an Amazon Fire TV stick into the HDMI port and power it over USB from the same device. Taihe does include an HDMI-to-Mini HDMI cable and a Micro USB-to-USB-A adapter, among other accessories, but it’s unfortunate that the 4K model’s I/O is so much better — you basically have to choose between that and touch functionality. Still, if you have the right cables you can use the Gemini with basically anything. I mentioned the PlayStation Classic earlier, because the Gemini is a particularly good fit for retro consoles; you can power them off a USB battery pack and play anywhere without a wall outlet. Taihe claims five hours of battery life, and I managed to use it for about that long playing through a bunch of the original Metal Gear Solid — which is to say I nearly finished the game. I’ve also used it hooked up to my MacBook Pro over USB-C, and if the weather hadn’t been so cold recently I’d consider it a pretty good two-monitor solution for my roof terrace. It’s a classic gadget I don’t know why there haven’t been a million devices like this already, because it’s an obviously convenient design that I think most people could find a use for. I don’t think the Gemini is the best possible iteration, however; the 1080p model’s panel is mediocre, its I/O situation is weird, and its menu system is fiddly. But it’s good enough, particularly for the $219 it’s been selling for on Kickstarter, to untether me from my couch and my desk in certain situations. It’s a classic gadget; it is what you make of it. Taihe says the 1080p model will retail for $299 while the 4K model will cost $499, though they’re available to backers for $219 and $329 respectively on Kickstarter right now. As ever, you should exercise caution with small companies on crowdfunding sites, but in this case I can at least confirm the product’s existence and performance.